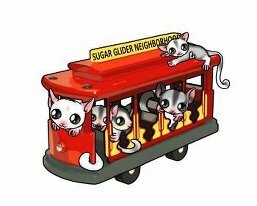 the SUGAR Group is again hosting a contest open to ALL glider owners. We are seeking the biggest and cutest personalities for recognition this year. Winners of each category will receive a calendar in which their photo will be featured one month. submitted today through January 18, 2013. * In order to ensure that votes are counted accurately, the votes will be tallied by three individuals at the RRRoundup. The three individuals will include at least one SUGAR Group staff member and at least one person who is not on staff with the SUGAR Group. Votes will be tallied on Thursday, Feb. 28, 2013. * Winners of the categories will be announced at dinner on Friday night, March 1, 2013. All paid registrants for the RRRoundup (including those who are participating online) will have access to view the dinner and winner announcements. * All entries are given with permission to the SUGAR Group to utilize the stories and/or photos at the RRRoundup, in the calendar, on our facebook page and on our website. * Winning photos from previous years are not eligible for submission. ** This is meant to be a FUN event and in no way an actual gauge of popularity or personality. Only enter if you do so in aspirit of fun. Bring on your nominations! You only have until Jan. 18 to get them to us!!!! Personality Plus Awards Voting is open!!! Head on over to http://www.sugargroup.org/Personality-Plus-Voting.html to cast your vote for your favorites of the finalists. Voting will be open through Feb. 21, 2013. Winners will be announced at the RRRoundup on Friday night. Winners will also be posted on TSS and on the SUGAR Group's website in mid-March. Good luck to all the amazing photo finalists!